Our 2009 Annual Meeting, held at the Morton Center, was well attended by residents who appreciated the informative presentation by Stan Lambert the Executive Director of the Wabash River Enhancement Corporation (WREC) on what the future developments and recreation facilities may look like along the Wabash. He updated the group on where WREC is in the planning process and what the next steps will be. Chandler Poole talks to New Chauncey residents as Stan Lambert looks on. Chandler Poole and Police Chief Jason Dombkowski updated the audience on the changes the city has made to its structure to better serve its neighborhoods, including New Chauncey. They touched specifically on the Neighborhood Resource Team (NRT) and how it has been organized to focus resources and efforts on specific issues including code enforcement and over occupancy. Rick Walker is the supervisor for the NRT and emphasized the importance of communications with the people in the neighborhood and the City. If you have any questions about the NRT program, contact Rick via email or by calling the Police dispatcher (765.775.5200). Chandler introduced Dale Dixon as the City’s Housing Program Coordinator. Dale helps to ensure rental units in the City are registered and meet the City’s rental unit requirements. There were a number of good discussions regarding neighborhood issues and concerns. Mayor Dennis spoke briefly about helping the neighborhood look to the future as that is what can be changed. Gary Sparger and Chief Domkowski emphasized the need for people calling in complaints to fully identify themselves to the 911 operator or police dispatcher and give as much detail as possible when calling. This allows the responding officers to more full investigate the complaint and provides the department a way to follow up with the caller if additional details are needed. Generally, the attendees felt the City is being much more responsive to the issues in the neighborhood and are doing a very good job of enforcing the City code and parking regulations. 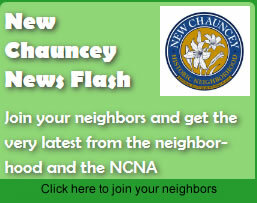 Mayor John Dennis discusses the New Chauncey Neighborhood and the City’s focus on maintaining the high quality of life in and around the NCN and throughout the City of West Lafayette. important communications between the residents is to continual improvement of the area. Walker updated the group on his teams code enforcement activities and showed so before and after photos. He also addressed yard trash enforcement and has been working to make sure everyone keeps the area clean and presentable. The photo below is an example of a house where residents were cited.